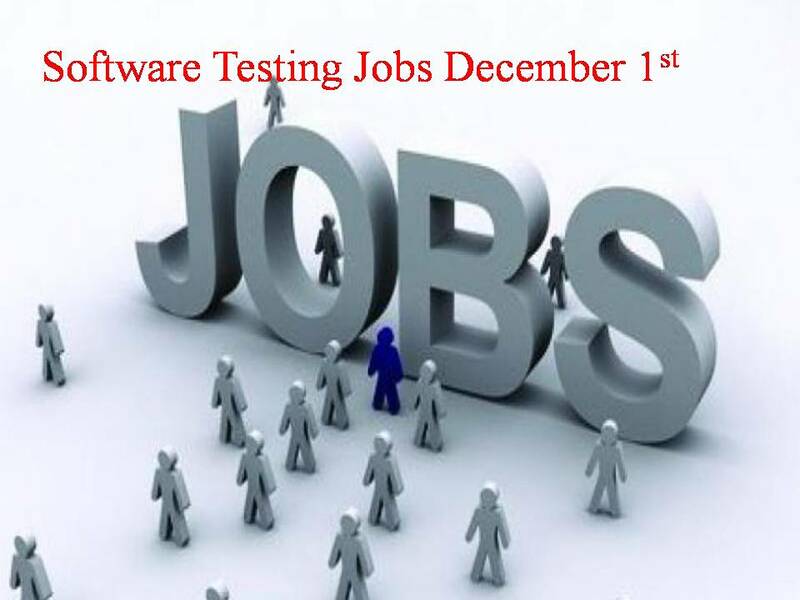 > Walk in for Manual Testing profile, if interested please walk-in for an interview on 3rd,4th & 5th Dec ’18 if you meet the eligibility criteria. Company Name : Carnelian Technologies Pvt. Ltd.
Company Name : Impetus Infotech ( India ) Pvt. Ltd.
> Minimum 5 years of experience with Functional, inter-op, Load testing & Automation of communication applications having SIP, SDP, RTP, SRTP, RTCP protocol based IP telephony serving Mobile, Web and Desktop clients running on Windows, Mac OS and Linux. > 5+ Years of experience with building in-house or industry standard test automation for IP Telephony, Audio-Video quality analysis & Scoring, Network impurity generation, Packet capture & Analysis, Analytics. Contact Company : Impetus Infotech ( India ) Pvt. Ltd.
> 2-7 years HP UFT experience needed. > Strong knowledge of Hybrid/keyword Automation framework. > Well aware of HP QC/ALM and HP ALM integration for automation. > Assist dev team to Perform root cause analysis and determine cause of problems in order to develop specific solution to an issue. > 4 to 6 yrs of quality assurance testing experience is required. > Must have lead team & team leading experience is must. > Strong background with Manual testing, Web application testing, Black box testing. > At least a bachelor degree or equivalent industry experience. > Proven experience in QA methodologies. > Participate as a team member & fosters team work by inter-group co-ordination within the modules of the project. > Rich exposure to System Development Life Cycle (SDLC). > Strong Experience in core java Programming, Selenium Web Driver & TestNG. > Well versed with Handling Elements in Selenium Web Driver. > Result oriented, self-driven, highly motivated, smart and willing to learn new technologies, methodologies, strategies and processes. > Experience in designing and executing Test cases, Test Scripts based on requirements and specification. > Test Planning, Test Cases Preparation and Execution. > Ability to document the test results and log issues in issue tracker [JIRA]. > Excellent written and verbal communication. > Ability to interface with Client, development team and get the issues resolved. > Understanding working in Agile Development. > Hands on testing experience in SAP MM / PP modules. > Manual testing experience in Material Management and Production Planning modules. > Experience in SAP processes for Purchasing, External Services Management, Inventory Management, Physical Inventory, Valuation, Account Assignment, Consumption based Planning, Quality Management in MM and Vendor management. > Thorough understanding of SAP software. > Salary: INR 50,000 – 3,00,000 P.A. Company Name : Proseon Technologies pvt. ltd.
> QA for a variety of platforms: Desktop Software (.NET), Mobile/Tablet (Android/IPhone) & Web (ASP.NET). > Hands on working experience in Mobile testing – Android, Windows and iOS.Good in Manual testing, test case design, test execution and reporting. API Testing.Postman and SOAP UI. Experience in Agile projects. > Must have 4yrs of experience in Jmeter(mandatory) in current project. > Must have performance Testing experience (Load, Stress & Failover testing(mandatory)) with Jmeter and can join Immediately. > Experience in Performance testing on AWS infrastructure preferred. > The successful candidate will be an experienced Sr. Performance Test Engineer with a track record in delivering multiple concurrent, complex projects.